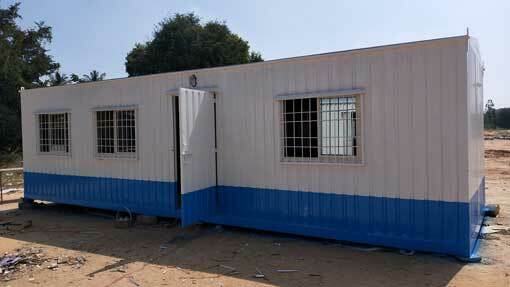 SAMAN POS India Pvt Ltd delivers a wide array of custom-built shipping container houses across India and overseas. As a leader in the field, we have strived hard to live up to our reputation and the expectations of our customers by offering high-end manufactured products and prompt customer support. 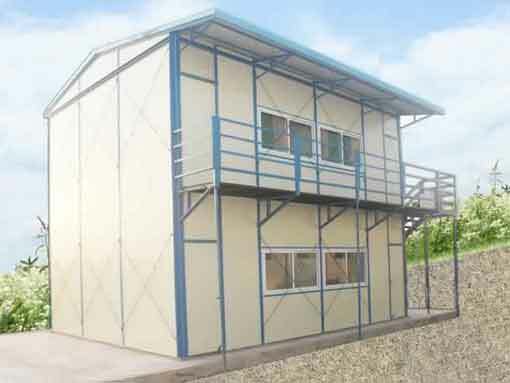 We a prime supplier of prefabricated house, mobile homes, portable office, prefab toilets, pre-engineered farmhouses, modular kitchen, container hotels including more than 30 variety of affordable options. 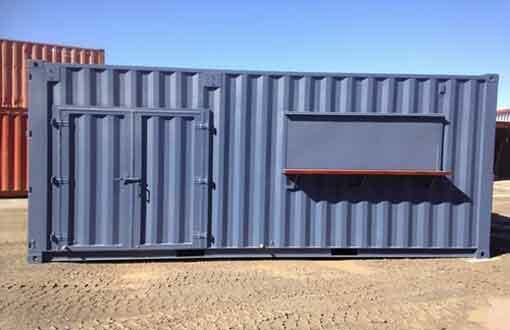 Whether you are looking for building your safe abode or expanding your family inherited property, our shipping container house is one of the best options you will find which offers affordability with convenience and a myriad of amenities. In a world where elegant architecture resembles prosperity, a customized shipping container house helps in escalating the reputation of the owner, through unique models and mesmerizing interiors. Safety being the prime purpose behind building a house, a shipping container house by SAMAN POS India Pvt Ltd completely live up to your expectation. 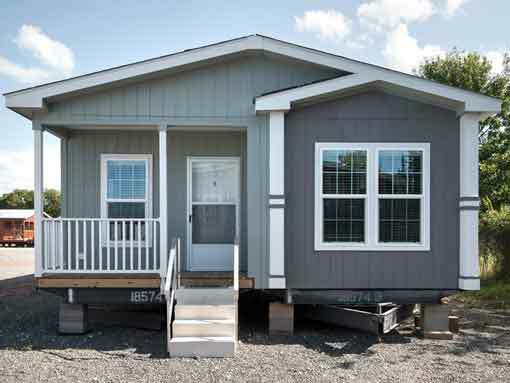 The procedure for construction modular homes requires adhering to stringent manufacturing processes and complying with International Safety Standards. All our procedure materials cover an extensive quality testing procedure via the supervision of our procurement officers. Hence, the end-product delivered by us promises safety and authenticity. We use ACP as our core materials, which carries a reputation for its unique endurance, durable and resistant features. All our products hold the capability to endure the uncertain climate conditions such as heavy rains, hailstorms, crackling summer including calamities like Earthquake, flood, cyclone, hurricanes etc. Moreover, the Government has a stricter approach towards prefab building manufacturing process compared to a traditional building, making it a more reliable option. Building a prefab shipping container houses requires way less budget than a traditional structure. not only traditional structures invite a myriad of construction hurdles like land permit, land allocation, payment to workers, raw material allocations, transportation etc. ; it also costs you a fortune. As they are permanent, you can’t transport them to a different place now you can modify them later. 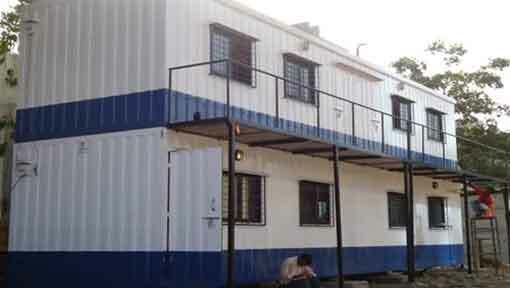 With a Shipping container house, you can build yourselves a reliable home with a price as low as Rs 1100 per sq.ft. Forget all the hassles or the long waiting period. 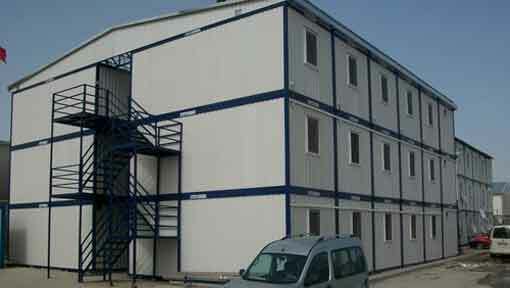 All the parts of our container houses are manufactured at an off-site location. It eliminates the cost of hiring labors, raw materials etc. All you need is land and your customized shipping container house will be assembled within 3-6 days. Imagine the time you will spend on building a brick and mortar? Hiring, allocating and finishing the house might take up to months and may even year. What if we tell you that we can offer a much better house within a couple of weeks? Yes, it’s True. Our shipping container house at SAMAN POS India Pvt Ltd only takes a couple of weeks to manufacture and the installation process ranges between 3-6 days. Our products come directly from the manufacturing site and assembled on the allotted site. Choosing us will save your time significantly, which you can utilize for your primary work. It highly productive for businesses like mining, construction, etc, whose business model requires regular traveling. What qualifies as a home? Convenient living, lavish interiors, or amenities? 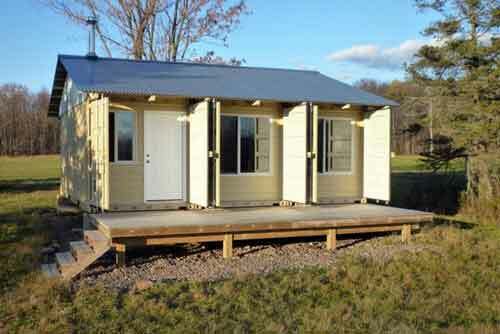 cause with our shipping container house, you will get it all. 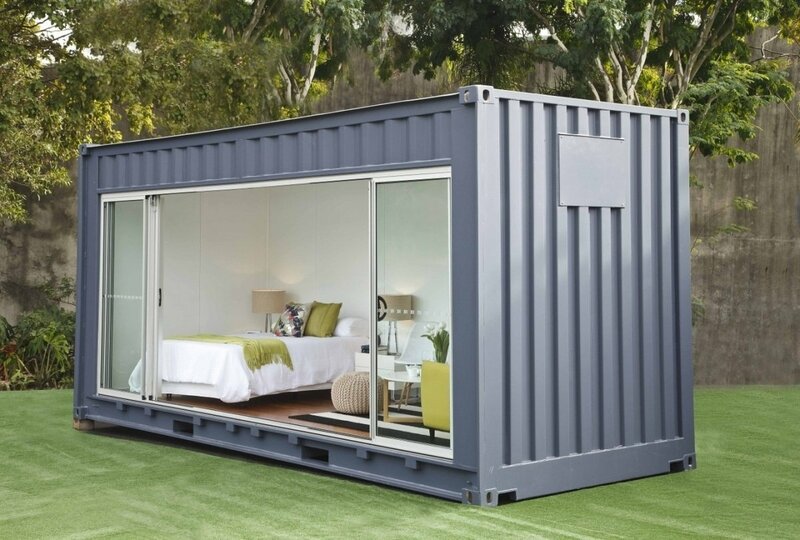 If you think a prefab container house looks like a container box, then you can’t be more wrong. We feeling of living inside a house mostly comes from the way it looks. Our SAMAN Portable team includes a qualified team of designers and engineers, who helps you manufacture a customized house that possesses the aesthetics of a traditional structure. The concept of Shipping Container House has taken the market in the storm with an endless array of custom-built structures with elegant and modern layouts and designs. The emergence of a shipping container house offers the user a chance to users for remodeling their house without any hefty expenditure. With traditional houses, remodeling means destroying existing layouts and rebuilding them, which not only costs your hard earned savings but also takes months to finish. As our prefab buildings are foldable, you can easily remove or add more structures without going out of your way. Whether you are expecting new guests or you want to remove some spaces and install something else, you can do it within a day. For great designs, you can call us, mention your requirement and expect a prompt delivery at your doorstep. In the pull between budgetary concern and time consumption, mostly we forget to consider the environmental harm that causes while building a traditional structure. Apart from causing massive air pollution, they also cause noise pollution, water, and soil pollution as well. However, you can select our shipping container house, which is manufactured with eco-friendly raw materials using ultramodern technology. As our container houses are made off-site, you don’t have to do any on-site work, which keeps the environment safe and save from neighbors from ear-deafening noises. Not only our ACP material and robust design safeguards and tasted as shockproof, corrosion proof, windproof and rainproof, they are also easy to install utilities and basic equipment. You can draft us a complete plan or you can take the help of our engineers while planning for a new shipping container house. We built customized structures which perfectly fits all your equipment right into place. Furthermore, we can deliver you a prefab structure that includes concealing cabinets, air-conditioning vents, ventilation points etc. If you are planning a house for a long time, then you are free to explore all option. 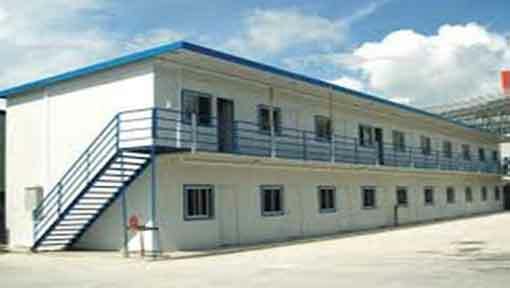 You can call us to get more information regarding our shipping container house. We are already more than happy to help you with your queries. You can also visit our store or call us to get a price quote for your affordable home.